How to Check if Your Diamond is Real or Fake! Quick instructional video on how to check if your diamond is fake. 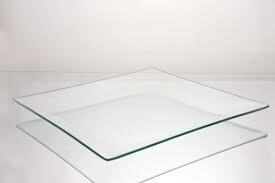 You’ve heard that a diamond can scratch glass. That’s true, but many other gemstones do as well. So even if your diamond is real, you may damage it by scraping it across glass. So leave this authenticity test for MacGyver. 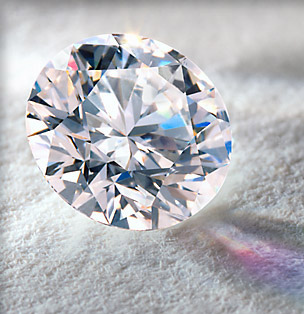 Real diamonds disperse heat instantaneously. You can tell if your rock is the real thing by fogging it up like a mirror. If it stays fogged for 3-4 seconds or longer, it’s a fake. A real diamond would clear instantly. 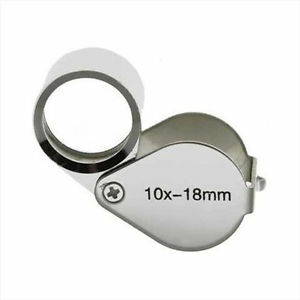 This do-it-yourself test only works if your diamond is loose. After first making sure it is clean, place your umnounted diamond on top of newsprint with the pointy side, the pavilion, facing up. If you can read the newsprint clearly through the stone, then your diamond is a fake (probably a Cubic Zirconium, or C.Z.). Genuine diamonds scatter light as it passes through them, making the newsprint look a little burry. 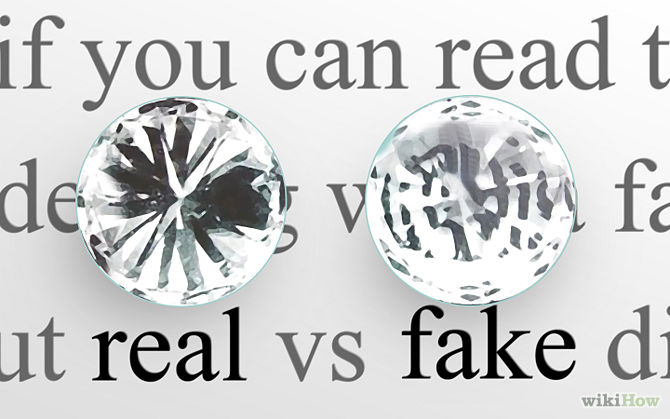 All fake diamonds have one thing in common, none have any inclusions or internal blemishes. So if you didn’t pay an arm an a leg for your diamond, yet it has perfect clarity…chances are you have a lemon on your hands. While it’s true that about a third of diamonds turn fluorescent blue when put under an ultra violet light, and 99% of fakes don’t, this test isn’t that accurate since not all diamonds have fluorescent qualities. 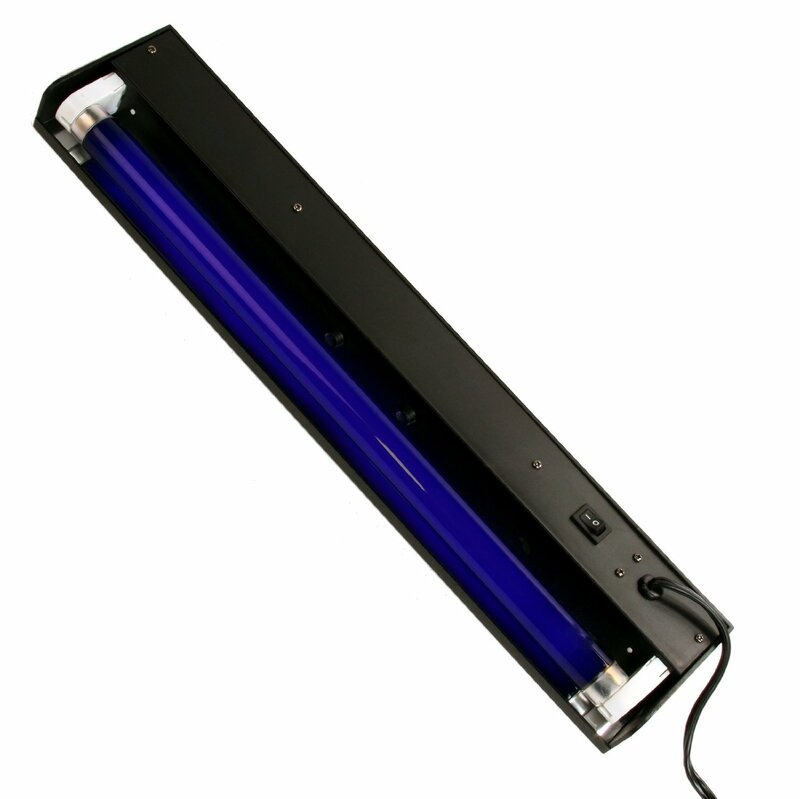 So while you could do this test yourself at home with store-bought black light, it wouldn’t tell you much unless your diamond has fluorescent qualities. Some real diamonds have flaws, that jewelers fix by injecting liquid silicone into the stone. This “clarity enhancement” is similar to the way chips in car windshields are fixed. Again, with this test, you will need to view your diamond unmounted. Turn the diamond onto its face, point side up, and examine it carefully. If you see flashes of single colors, then you are looking at a fracture filled, treated diamond. If you see flashes with many rainbow colors at once, then you are probably looking at a fracture of an untreated diamond. Quick instructional video on how to check if your diamond is real or fake. The best way to know if your Diamond is real, would be to have a trustworthy jewelry appraiser test it. 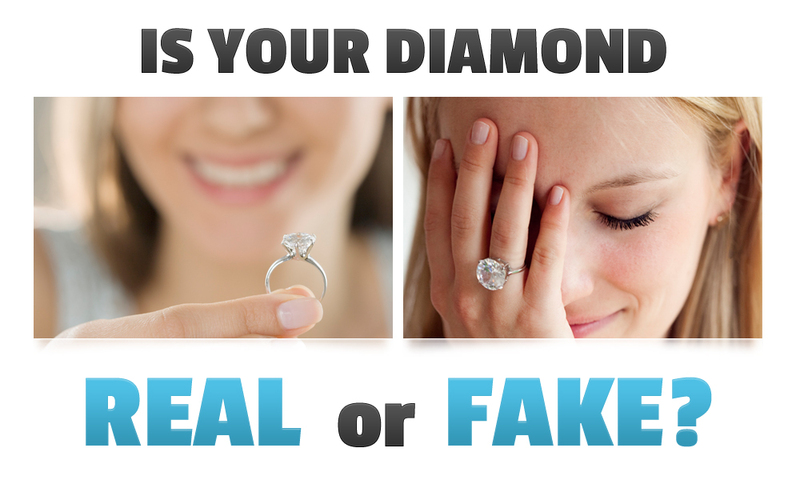 If you don’t have the time or know any then check out this video on how you can tell if your diamond is real or fake in the convenience of your home.